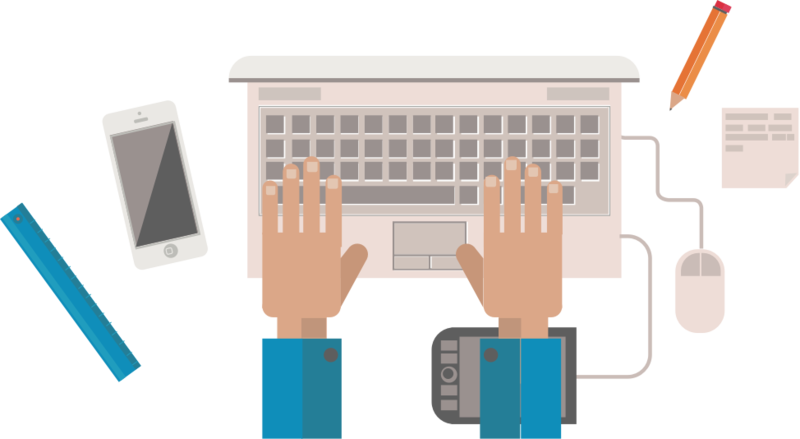 Exclusive tools for advanced WordPress developers who strive for fast, precise results. Avoid the time-consuming practice of rewriting code you've found online. 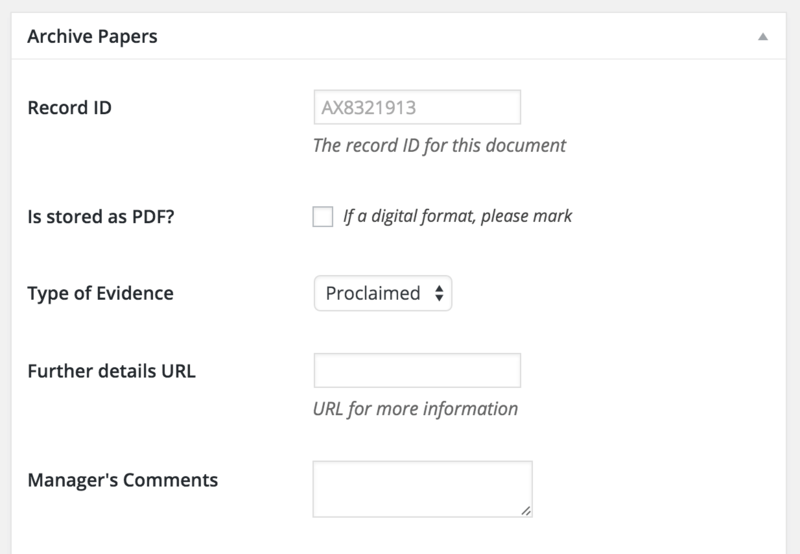 With one, unified platform, you'll be able to generate any component for your WordPress projects, fast. By using GenerateWP you can be sure that the code you are provided with is fully leveraging WordPress' internal security measures. Timely, technical support from the leading WordPress experts behind GenerateWP. 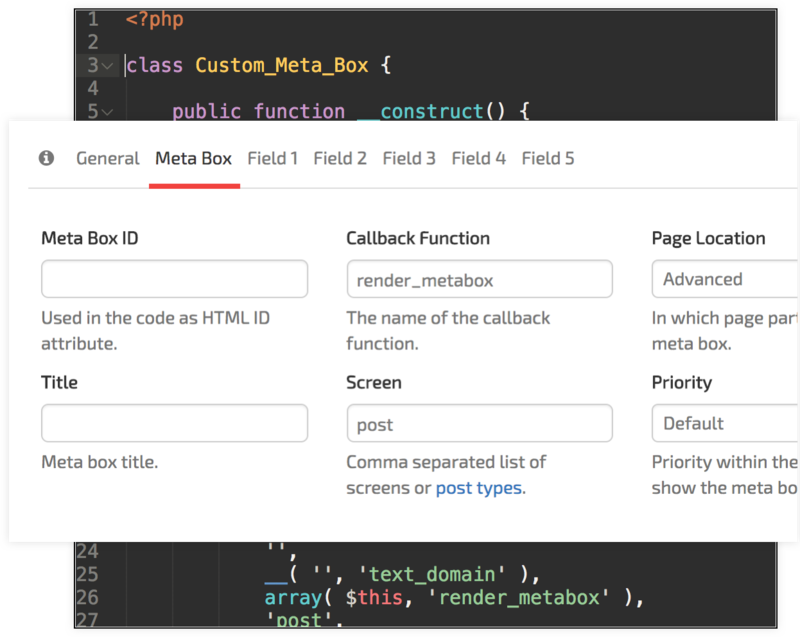 Build lightweight, highly customizable Meta Boxes, effortlessly. 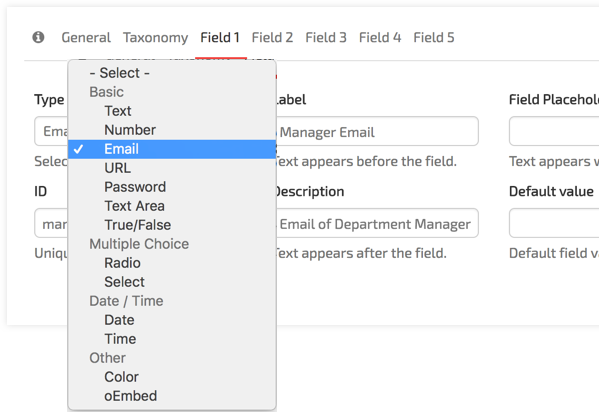 We offer over 18 types of fields (beyond natively supported WordPress fields), from regular Text field, Text Area, Email, Numbers and Radio Buttons over to Color Picker and oEmbed. Whatever field you need — we got you covered. 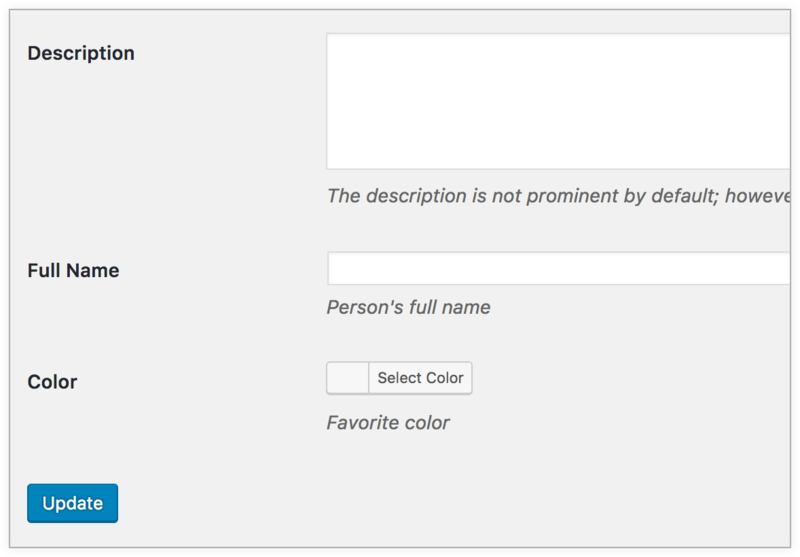 Produce good looking Meta Boxes that leverage the existing WordPress styling. Keep the fresh look going throughout all WordPress versions! The Meta Box generator guarantees full backwards and future compatibility. The Meta Box generator comes with extra features such as controlling the location of the Meta Box within the page, its priority (how high up, or low down it shows), on what Post Type screen, and more and more. We offer over 18 types of fields, from Color Picker field, URLs, Emails, Date & Time and many more. Whatever field you need — we got you covered. And it's constantly growing. Integrate fully with the Term Meta screen and produce good looking fields that mesh with the native WordPress interface. Fields that offer selection of multiple options. Create stunning elements for sidebars and widgetized areas. Different themes have different widgetized areas, like in the footer / sidebar. The Widget Generator allows you to build custom elements to be used in these areas. Make powerful and functional WordPress widgets with this exclusive generator. Just add your custom logic and you're set to go! Create insightful widgets to enrich user experience and increase engagement. A dashboard widget is a small box in the WordPress dashboard where stats and other summarized info is displayed. Leverage this awesome native piece of functionality that WordPress offers to impress your users! you can get any native functionality working in just a couple of minutes. Curious about other Premium generators? We keep on regularly adding premium generators. Great tools that save time. Love it! I use them in every project.